This practical home shredder provides sufficient security to shred confidential documents into little Cross-cut cut pieces. 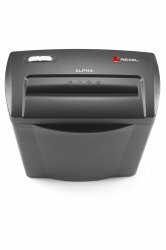 The Alpha Shredder takes 5 sheets at a time and has a 14 litre bin which is easy to empty as the head simply lifts off. The Rexel Alpha Cross Cut paper shredder provides affordable mid-level security, shredding down to 4 x 36mm P-4 cross cut (confetti) strips. This allows everyone to achieve a confidential level of home or small office security. The convenient lift-off head helps customers to easily dispose of their shredded waste. The bin can hold up to 14L - or 60 sheets of shredded paper. A compact design means that the Rexel Alpha Cross Cut paper shredder can be safely tucked under a desk or beside a chair without getting in the way of your work or home life. The small size also means that the shredder is easily retrivable in situations where customers shred infrequently.